It’s a mucky, slimy, gloppy mud. A young elephant snorkels on his side, the tip of his trunk swiveling above the surface, as he slides towards the other elephant, a brother or cousin. His days are filled with heat and dust. 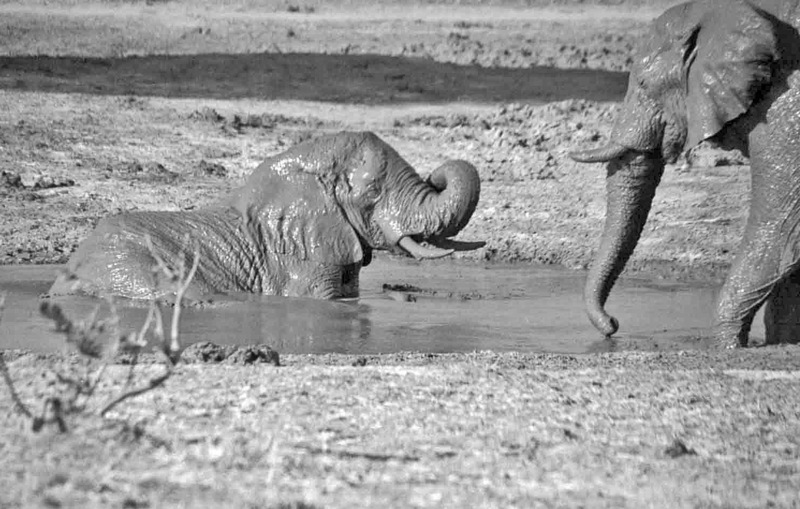 It’s winter in Botswana, the sun is relentless, and mud will soothe his scorched skin. He lifts his head from the muck, curls his trunk and closes his eyes. This feels good, his body language says, this feels really good. If we could imagine ourselves weighing four tons and think of gravity’s effect on those four tons, then maybe we could imagine wallowing in such mud, pushing and shoving like giant sumo wrestlers, reveling and rolling in the sheer pleasure of warm gunk. We would inhale a slimy trunk-full of ooze, squirt it like a water gun in any direction, even at each other. We would rub our eyes clear with a curled fist at the end of our trunks. We would arise glistening and bright as a metallic statue. We would be cooled, refreshed, gigantic, gentle beings. . . . if we could imagine such a thing. Your words paint pictures in my mind! Great writing and lovely photo! Thanks, Babs! I try to conjure images in with my writing. Good to know it works, sometimes.